Starting Thursday, May 25, twenty-six Cal track and field athletes will battle it out at the NCAA West Regionals in Austin, Texas, for chance at a golden ticket to the esteemed NCAA Championships. To qualify for regionals, these 26 Bears must have placed within the top-48 in the nation within their respective events. But among the top-48 qualifying athletes in each event, 36 will pack their bags by Saturday with their seasons over – no golden ticket, no shot at NCAA glory. Athletes from across the western part of the country will be looking to systematically knock off their competition in pursuit of one of 12 bids to nationals. Surrounded by a sea of excellent athletes, the Bears must find a way to upgrade their status from great to elite. Junior Ashtyn Davis, 2017 Pac-12 champion, is currently tied for the seventh-fastest time in the country in the 110-meter hurdles at 13.50 seconds. Davis has an undefeated outdoor campaign heading into West Regionals, but this meet will pose as the toughest test to his perfect record. Davis’ time puts him as the third-fastest hurdler in the meet, a mere 0.03 seconds behind top-seeded senior Aaron Mallett of the University of Iowa, and an even more imperceptible 0.01 seconds behind second-seeded senior Spencer Dunkerley-Offor of the University of Texas. Junior Peter Simon currently has the eighth-longest throw in the nation in the shot put with a mark of 19.74 meters. 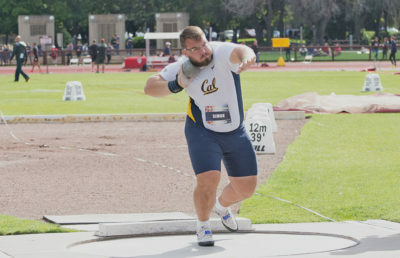 Just as Davis, Simon was a Pac-12 champion and he will be going into the regionals seeded third overall in his event. 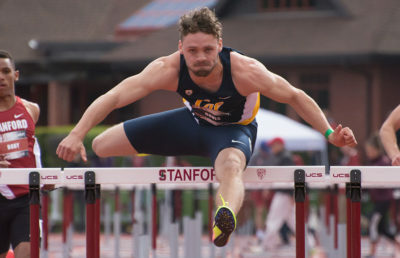 The pair of juniors are Cal’s only athletes ranked in the top-three of the West Regionals performance list, but its high seeding does not solidify them a bid to nationals. Junior Bethan Knights has the next highest seeding of a Cal athlete heading into the meet, going in ranked sixth in the 10,000-meter run with a time of 33:30.13. A little more than a second separates the top-six contenders, which means that the smallest slip-up could have monumental impacts. Fellow distance runner freshman Robert Brandt finds himself in a similar situation as he will go into regionals ranked ninth in the 10,000-meter with a time of 28:48.38. Brandt is not just competing in the 10,000-meter run, but the 5,000 meter run as well, qualifying with a time of 13:45.45. He will go into the meet ranked 11th. The last Bear ranked in the top-12 of the meet’s start list is sophomore Jordyn Colter who is 12th in the 800-meter run. Colter is approximately six seconds shy of frontrunner junior Raevyn Rogers of the University of Oregon. A mere one second separates contestants eight to 15 in the event, meaning Colter will have no room to breathe as she shoots for nationals. The rest of the Cal’s squad lands in the mid- to lower-range of the list of 48. For the Bears that are on the bubble, including seven athletes that are seeded from 15th to 19th, they will have to fight their way into the top 12 and prove that they are worthy of a bid to the promised land.